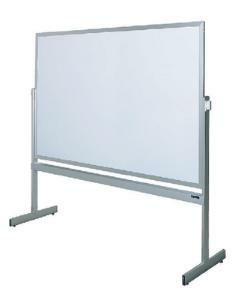 Both sides of this 4' x 6' lecture board feature a white markerboard, ideal for additional writing space and quick topic changes without the need to erase. The board revolves horizontally and features a locking device to hold the board at any desired angle. It is framed in heavy-gauge anodized aluminum and mounted on swivel casters for easy mobility. It comes with four markers and an eraser. Weight: 100 lbs.